April 21 is one of those oddly specific food holidays that give us a headache. Cashews? Cool. Chocolate truffles? Love ’em. But do you have any idea how difficult it is to find a chocolate covered cashew truffle? Has anybody in history ever actually made one?! They simply do not exist. Or if they do, they are impossible to find. But we weren’t going to let a little thing like that stop us from successfully completing this challenge! Cashews are the seeds of a tropical evergreen plant native to Brazil. Related to the mango, pistachio, and poison ivy (yikes! ), cashews are kidney-shaped seeds that grow on the outside of their fruit, the cashew apple. Cashew apples are sweet, flavorful, and a highly prized delicacy, but are not marketable because their flesh is extremely perishable, and they begin to ferment the moment they are picked, barely lasting 24 hours. In their immediate growing locale they are often found canned, and are used to make jams and liqueurs. Most of us will never get to try a cashew apple in our lifetimes. Sniff. Cashews, on the other hand, are readily available. They are never sold in the shell, however, because they contain a black substance called cardol, a toxic skin irritant that can only be properly destroyed through roasting. Even then, it must be done outdoors, as the fumes from the smoke can cause life-threatening complications. Again: yikes! Sure seems like a lot of trouble for a mere nut. Chocolate truffles, on the other hand, won’t kill you. Unless you eat too many in one sitting, of course. They were created in the kitchen of our good friend, renowned French chef Auguste Escoffier (Peach Melba, Pears Helene, Melba toast) in the 1920s – by accident. An apprentice inadvertently poured hot cream into a bowl of chocolate chunks instead of the sugared egg his pastry cream recipe called for. As the mixture hardened, he found he was able to shape it into a ball. He then rolled it in cocoa powder and realized it resembled a truffle, the prized fungus found in France and Italy. Hence the name. Because we couldn’t find chocolate covered cashew truffles, we had to get creative, much like when we celebrated Heavenly Hash. So we bought cashews, and had some chocolate truffles left over from Christmas. A little knife work, and voila! Instant chocolate covered cashew truffles. 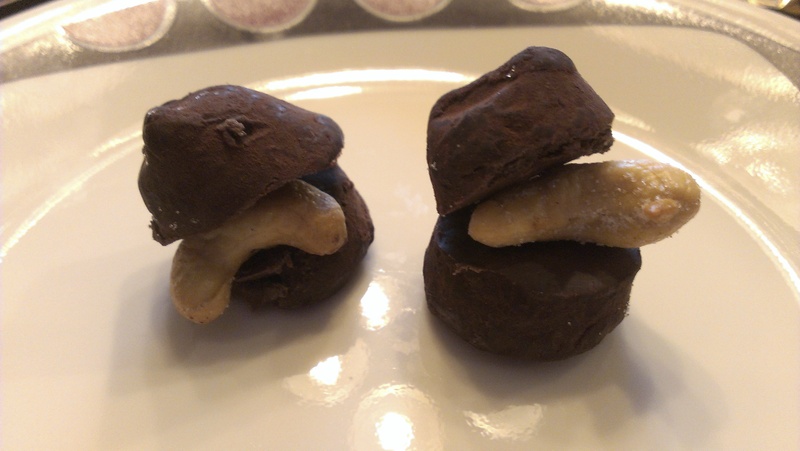 “Homemade” chocolate covered cashew truffles. Two things: who comes up with these holidays? And what is wrong with you!? You had truffles just sitting around SINCE CHRISTMAS!?!? 1. Anybody can petition for a food holiday – they just need to find government representation. Admittedly, this is one of the stranger ones. But so was Dog Biscuit Appreciation Day! 2. That does seem rather odd, huh? Probably because of all the dessert-type food challenges we’ve had to focus on. You’ve made them? Sure…I’d be interested in learning how. Although, it’s awfully tempting to just swing by Moonstruck Chocolate in Portland for some of their amazing flavors. Yes I have. Put that on your to-do list the next time you come up!